While they have been around for a while and the gameplay is a little outdated, I love these games and love even more playing them with friends. Welcome to the Weekly Co-Op! The final cooperative game is the Ultimate Alliance Bundle! Ultimate Alliance is one of my favorite games. The game is a top-down action-adventure game. There are 4 playable characters in a party, and the point of the game is to beat the evil villain. Each character has their own powers, and everything can be upgraded. The gameplay is a little hard to just jump into, but I would recommend playing through each game fully with someone/other people. Ultimate Alliance 1 pits you against the evil villain Dr. Doom, and the adventure takes you across multiple worlds and universes. Ultimate Alliance 2 pits you against a mysterious power that has been corrupting villains and heroes alike, and it is up to the Marvel heroes to save the day. Both games feel old at this point, but they are both still pure fun and I love returning to them. The upgrading, various amount of players, and plenty of collectibles allow you to not only play through both games, but want to return to them to see what other characters can do and what combinations to put together. The reason this is in this blog is because teamwork makes the game harder rather than easier, but I think this is a welcome challenge since the game feels very easy on Normal difficulty. Adding another player makes you more aware of everyone’s health and think about how you approach combat. I think the dynamic introduced some welcome challenge to an already fun game. While these aren’t going to stun you with game play or graphics, these games are plenty of fun. While the bundle comes in pretty steep at full retail price ($59.99), I have gotten more than enough out of these two games to warrant the price point. Furthermore, this bundle goes on sale all the time at much lower prices. I would recommend waiting for a sale, but definitely don’t miss out on these games. For now, that’s all! I may come back with a different topic or something, but as of now, this is the last scheduled posts for a while! I hope you were able to find something worth while in this blog! It may be a little pricier than usual, but this is the cornucopia of party games. The final game for the competitive category is actually a series, the Jackbox Party Pack! Yes, this is the most expensive game I have talked about so far; however, this is actually a bundle of games. As it turns out, there are actually 4 bundles (JB Party Pack 1, 2, 3, & 4), and all of them are pure gold. While the title is just the first bundle, I will be speaking freely about all 4. This is the bundle to buy if you are looking for low-investment, easy-to-play video games. Each game is basically an digital board game. Each player logs into a website designated for the game and puts in a game code and a player name. There are no filters, so beware streamers or people playing with children! The game itself is usually pretty ‘PG’ or ‘PG-13’ at most, but the people you play with alter the game pretty heavily. Each game has a few rules, and then each player participates. For example, the game Fibbage requires each player to answer the same prompt, and then all the players have to guess the right answer. Points go to anyone who can fool their friends into picking their answer and anyone who can guess the right answer. All of the different games included in each bundle play pretty differently, and the announcer explains the gist of each game as you play. Every time I see a group of friends and we all want to play video games, this is always one of the games we play. These bundles are beyond worth the price and have not stopped providing me and my friends from constant laughter and memories. I cannot say enough good things about these games. Please buy them if you play with friends often. Is “frustratingly-fun” a term? Well, this game is that. This week’s cooperative game will be Mercenary Kings! Fight your way through plenty of soldiers, robots, and other… interesting… enemies! Mercenary Kings is a story-driven, 2D, modern-pixel-art platformer. To be completely honest, I could not tell you what the story of the game is. While I am sure it is just fine, that’s not what makes me remember this game. What I remember most is getting very frustrated due to my friends. Playing this game with other people is what makes this game worth playing however. Playing by yourself is fun and relatively simple, but this game shines when others are involved. This game requires a lot of precision throughout (as with most action platformers), and adding other players just makes it harder to see things and get through a level. While this sounds like a setback, it makes the game so much more fun. The game is relatively basic in terms of a 2D platformer: run, jump, shoot your way through each level, and adding people makes doing that just hard enough that it becomes a fun challenge to play with others. It will also help test your teamwork as the game is kind of hard for anyone that does not game regularly. One thing that helps this game stick out is how much you can customize. You can choose different players that each function a little differently, you can change and upgrade your weapon HEAVILY, and you can change up how you play the game (jumping through the game, strategically planning how to traverse each room, etc). The variety of this helps the game feel different throughout along with progressing through an ever-changing storyline. While I personally think this comes in a little steep at $20, I do think that it is worth the buy if you are looking for something more retro-feeling that you can sink your teeth into with some friends. Uh oh! It looks like next week will be my last two scheduled posts! I may continue to post in the future, but they will not longer be coming out every Tuesday and Thursday. Make sure to check in next week to see my last two local multiplayer choices! They are some of my favorites! Do you like arena games where you need to defeat your friends? Well, add anti-gravity to that and you have this game. This week’s competitive game will be Paperbound! Paperbound is all about hacking and slashing. The point of the game is to get to your portal, but the path to get there often changes, and that is what makes this game so fun. There are plenty of characters to choose from even though they are purely cosmetic; however, the map choice is wide and varying. Each map is an arena, but its construction is different. Some maps have spikes on the sides, some have no sides, some are really small maps that are completely enclosed. Apart from this, there is also different game modes to play. From simply killing each other to capturing an object and holding it (a la King of the Hill game types), there is enough variation to keep the game fun and new for a while. Even though there is not a lot of actual content in the game (set number of maps, set number of characters, set number of game types), the reason I chose this game is because of its’ unique take on the genre. In terms of gameplay, this game is relatively hard to jump into. There is figuring out how to attack, how to throw effectively, and using the environment in the map appropriately. Once you figure that out, there is the entire anti-gravity addition that changes the game entirely. Anti-gravity is such a weird concept to mess with that it alone is what puts this game on my radar. It completely changes how you approach winning. Instead of trying to get to your enemy across the map and hitting them, you can now just switch gravity and “fall” towards them and slash them as you pass them. There is so much opportunity to experiment with how to traverse each map that it makes each time you play feel just different enough to keep you around. While this game may be a little hard to just introduce to casual gamers, it is definitely a lot of fun and has given me and a few different groups of friends a lot of memories. For $10, this game is well worth the price for how much use I have gotten out of it. I didn’t have anything funny for this intro, but this game is really fun. This week’s cooperative game will be BattleBlock Theater! One of the nicest parts about BattleBlock is that it’s a fresh take on 2-D platforming. This game may not be suited for very casual gamers, but it is really fun if you have a dedicated friend to play with. Movement is a great balance between having to make quick decisions and waiting something out. 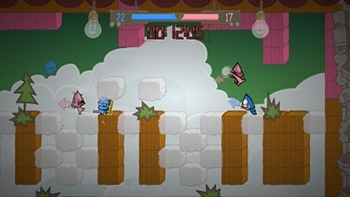 Players have to run, jump, dash, punch, throw, and collect their way through each level, trying to get the exit sign. Each level feels very different, and the way you have to solve each is just different enough to feel refreshing. Coming in at a sharp $15, this is definitely worth looking into if you’re a “bang for you buck” kind of person. Do you remember playing “Horse” with your friends in Basketball? Well, this is sort of like that. This week’s competitive game will be Ultimate Chicken Horse! Ultimate Chicken Horse is a competitive game about trying to get to the finish line. How you get to the finish line, however, needs to be hard. Why, one might ask? If everyone finishes, no one gets any points! To make sure that you are the only one to finish, you must build some of the most dastardly mazes you can think of. At the start of each round, a random assortment of items will appear, and each player is to pick one. Once items are chosen, everyone has to place them somewhere on the map. The item you pick up really defines where you put it. Pick a rectangle piece? Place it as a beam to walk on or jump off of. Pick up a crossbow? Place it in the way so you can jump over it but try to hopefully get your friends! Do whatever you can to be the only one left! The less people and more kills you get, the more points you get. The person with the most points wins! That is the just the base, classic game. There are different gamemodes, plenty of different characters, tons of tools and weapons to use, and various maps to play and unlock through gameplay. This game offers plenty of fun with friends and even plenty of fun on your own to see what kind of crazy creations you can come up with! At $15, this game is a steal. Weird physics, ragdoll players, and goofy controls. What more could you ask for in a game? This week’s cooperative game will be Human: Fall Flat! Human: Fall Flat is all about traversing the area around you to find the end. There is usually a path you can follow, but the way the game is made, there is endless possibilities as to how to get to the end. You play as these ragdoll people, that can be customized, and must make your way through each level using anything you can grab onto. The way the game works is the triggers control each arm and you can jump and move around. The innovative thing about this game is what the arms can do. Each arm can attach to any object and hold onto it. Using this, you can try to swing around objects, pull yourself over, or even use yourself as a ladder for your friends! Speaking of friends, this game is impressively fun on its’ own, but adding other players to the mix is what makes this game so much fun. Try to beat your friends to the end, work together to move objects around to get to the end, or just use your friends as the objects and do it that way! There are so many opportunities for your imagination to flourish in this weird, unique game. There are not very many levels of this game, but that is because each level is jam-packed with enough ways to try something different that it can make playing the game again and again feel different every time! Human: Fall Flat is a wacky adventure to take on with your friends and is well worth every penny needed to get it. Playing dodgeball in school has always been a fan favorite of many kids. Once you leave school, however, dodgeball becomes less and less prevalent. This game can help revive that nostalgia in a very… unique… way. This week’s competitive game will be Stikbold! A Dodgeball Adventure! Stikbold is all about accuracy and strategy. The point of the game is to take out your friends in whatever way you can. Most of the time this means a ball, but that can change. There is a story to this game, but the fun really comes from the multiplayer. There are a couple game types such as regular dodgeball or a soccer-inspired dodgeball game mode. There are only 5 levels to play these on, but the developers do a great job of making each one feel like its own environment. Each level has its own environmental challenges such as crabs that can kill you on the beach level or a hot dog stand that drops throw-able hot dogs in the gym level. The levels feel fleshed out and fun to interact in. The reason I chose to put this game on the list is because it is a fun to play yet hard to master game. Knowing when to dodge out of the way, knowing how to throw at an angle to catch someone, or even just knowing when to bump into someone or not can win or lose you the game. If you do get hit and tossed out of the arena, fear not! You are not done! 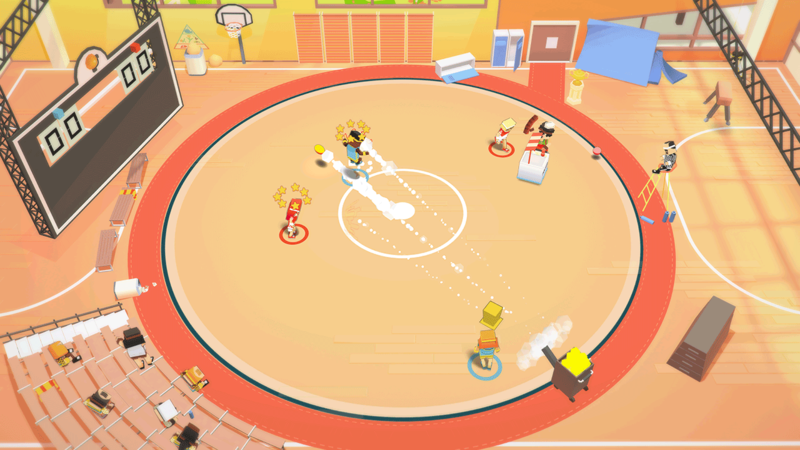 Stikbold allows players who are out to move around the arena and send in environmental hazards of their own to try and get some of the other players out as well. This is a unique game that offers gameplay that isn’t seen very often and does it in a wonderfully goofy way. The game is pretty cheap as well, so make sure to pick it up today! This is my favorite cooperative game. This week’s second cooperative game will be Magicka 2! Magicka 2 is everything I love about gaming in an awesome little package. It requires good memorization, quick thinking, and fast fingers to be good a this game, but it is just as fun to go through with someone who has no idea what’s going on. This is just a fun game. Playing by yourself is fun if you know what you’re doing, but playing with friends is fun no matter the situation. While I love this game, there is a lot to learn about the game. The story is your regular hero story: nobody can save the world from some bad guy and now you have to. The majority of learning you are going to be doing is based on the spells you use. You are a wizard, so you use spells. A lot. There is a melee, but it is pretty boring on its’ own. Spells make this game something like I have never experience before. There are too many spells to count, and they all start from 8 types (2 spell-types assigned to each face button with a trigger to switch between the two) that can combine or cancel each other out. For example, rock spells will be cancelled if you try to put lightning in the spell. To cast spells, the player has a 6 slot queue to put spells types into and cast something from it. For example, you could put 2 death spells, a rock spell, and 2 more death spells in your queue and area cast them to create a huge spiked wall around you. There are four different ways to cast as well: self, weapon, area, and beam. Each are activated different ways and all do different things with the same combinations. The spells and casting them are complex, but can be as simple as you want. Don’t feel like learning the spell to cast a swarm of damaging birds around you? No Problem! Shooting fire at someone works just as well! This is how this game is able to attract any audience. There is so much experimentation you could do, but you could also just learn the basics and be completely fine. *PSA: Make sure the people you are playing with know the revive spell and you can pretty much never die. It’s really easy to cast. Also, friendly fire is permanently on. There is so much more I could write about this game, but I think its’ best if you experience it for yourself. If you like getting to experiment in games and enjoy top-down brawlers, this is your game. I couldn’t recommend it more. Not enough wizards and knights in your life? Well have I got the gift for you! The reason I chose the second one is because of the memories it created between me and my friends. Have you tried playing puzzle games with your friends before? It is a wild adventure, and this game really helps that adventure flourish. Trine 2 is about the journey of 1-3 heroes set on a path of danger and mystery. To be completely honest, that is all I can tell you about the story. The reason I love this game so much is because of the game play. It is a 2D side-scroller, and there are plenty of puzzle and combat everywhere throughout each level. Work with water, fire, wind, and plenty of other elements and objects to traverse your way through each level. There are three heroes: a knight who excels at close combat and fighting in general, a wizard who is really the one solving a lot of the puzzles, and a rogue who is a balance of the two. You can switch between the three if you are playing by yourself, but this game shines with friends. Needing your friends to solve puzzles or work with you to do something is basic cooperative gameplay, and this game is no different. It makes you heavily rely on your teammates when you play to not only stay alive but also get through each level. For such a beautiful-looking game that is a blast the entire time with your friends, this game is definitely well worth the price. If it is a little high, Trine 2 often goes on sale as low as $3. Get this now if you need something to play with your friends and think you are good teammates!